I am going to be making a whole bunch of scarves, thanks to my SIL who requested an infinity scarf. Little does she know the tornado she has set off...I think everyone we know will be getting one!! Cute fabrics! I'd love to make some new tops for post pregnancy early next year. I've been wanting to try and sew knit headbands but I've never worked with knit before. These lovely fabrics would make the transition much much easier :) that floral!!! I would love to make a few last minute Christmas presents! An infinity scarf or two, and a little dress for a soon to be big sister! So cute! Do they ship internationally? I'm wanting to make lots of little headbands and leggings for my best friend, who is expecting a little girl in January! There are like a million new babies in my family. I want them all to have the cutest baby leggings ever! I would love to try making a scarf. I have made a few knit maxi skirt skirts I would like to make some scarfs for presents. I am loving how easy it is to make scarves and tanks for layering in the warmer southern weather! This fabric would be perfect! My girls desperately need some new leggings, so that's my next project with knits! I wanna make turban headbands!!! Little Sister is having a baby... hoping to make her some cute accessories to help in those early post-baby months! I will be making some shirts from a few cool patterns I have been w a bring to use. I just finished a tunic pattern for myself, so I'll be making one in every knit fabric I own! I just got two new dress patterns (for me!) so I need some knit! I want to try making the Out and About Dress from Sew Caroline. I'm new to knits, so I'm dying to get started! Headbands for my daughter and hats/pants for my baby boy due in March! Cute leggings for my girls! I want to make lots of lane raglans and comfy shirts and leggings! I'd love to make some little girl skater dresses (the twirly kind) for my nieces for Christmas! Shirts & dresses are always on my to-do list. Can't wait to make some scarves! I am in the mood to sew some pajamas for my boys! Maxi skirt for myself and my girls! I want to learn how to sew knits! What better opportunity than to learn on beautiful knits! Winning would sure give me some incentive! jocole leggings and the Hudson pants! This is such a great collection - I'm so excited about these bags!! Clothes for me and my boys. Mainly shirts but really anything that suddenly suits my fancy. Boy pants and maxi/ballet skirts! LOVE! KnitFix sounds awesome....I'd love to win this to see what it's all about. Please post the photo of your little darling's new leggings! Scarves, and I'd love to attempt leggings for my girls. Definitely some infinity scarves for my sisters and myself for Christmas! :) And I'd love to make some nice comfy pajama pants for myself too. LOVE getting new patterns and ideas for crafts! Thanks so much! Oh, I want to make some scarves for my sister with those! She would love those patterns! I'm going to make a bunch of pretty tops for myself, and my daughter. How fun! Some comfy tops would be great! Or maybe some scarves to gift for Christmas! Never sewn knits!!!! Would love to try..... especially with these gorgeous fabrics!!!!! Infinity scarves! Lots of infinity scarves! Love these fabrics. It's always fun to add pattern and color to my wardrobe - these look like mostly tops and dresses to me. 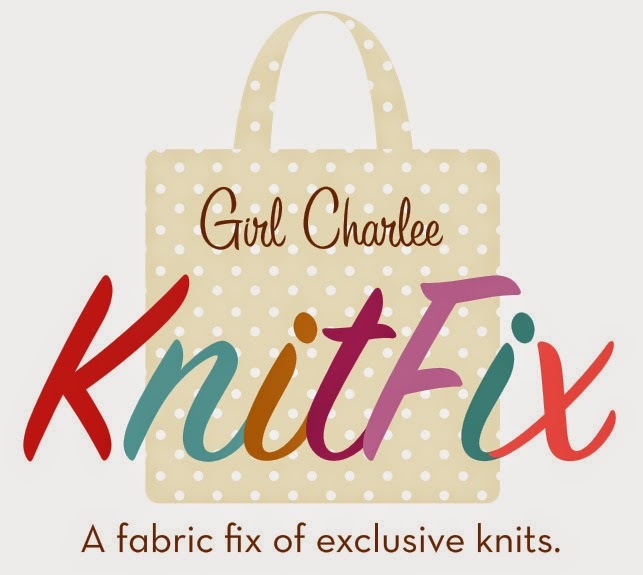 I am new to sewing with knits and obsessed with girl charlee... I need this!!! Leggings for myself and my daughters! scarves, shirts, leggings...so many clothes!! I'm just learning how to sew, but I'd like to make a skirt! Lots of drapey tops for winter! Love these, How have I missed them until now. Count me in. These are lovely, how have I missed these until now. Count me in, skirts and t's. Thanks for offering. Great fabrics for tops and bottoms, skirts, and scarves. Quilts with a special touch. Love to win this one 😎. What fun! Love the prints!!!! Would love to try to make myself leggings! My granddaughter loves for me to make her skirts and/or leggings for her and matching ones for her doll. I will be able to keep her very happy if I win this fantastic KnitFix prize package. I would like to make myself a tee or two and maybe an infinity scarf. Love these fabrics! I'd do a skirt too. What a great idea!! I'm still familiarizing myself with knits, and sew for my 3 nieces.....so, something for them! have some cute shawl and shirt patterns I would use it for! Looking forward to sewing with knits! Love this idea! GirlCharlee is a long time favorite! I am dying to make braided scarves for Christmas! Leggings and a few new head wraps for my baby girl! Would love to make leggings! I love GirlCharley knits..I've made some cute tops and look forward to making some holiday dresses. I love these fabrics. I could make some beautiful scarves for Christmas gifts. These fabrics are beautiful. I could make some awesome scarves with these. Perfect Christmas gifts. Anything for myself. I've been making so much for the kids in the family, this would be all for me. Dresses. I always like making and wearing dresses. love Girlcharlee!!! I would make maxi skirts and shirts.